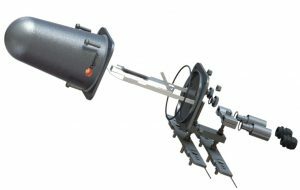 The 2179 CD fiber optic splice Closures protect fibre optic splices from the elements while providing fast and easy no-cost reentry. 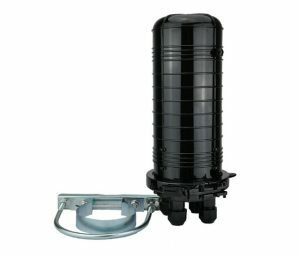 The closure comprises a plastic moulded dome shaped housing with fibre management trays attached to an end cap. There are 5 round cable entry ports and a single oval cable entry port for the main distribution cable. These ports can be sealed using heat shrink sleeves & a blow torch. No special tools are required for assembly & re-entry. Available in different configurations, the 2179 CD can accommodate various cable constructions and splice capacities. Each tray is designed to hold a maximum of 24 fibers. There is a provision for fiber slack storage (beneath the tray holder) for expressed stranded fiber. The slack storage and splice capacity depends on factors such as cable construction, splice type and slack fiber lengths. 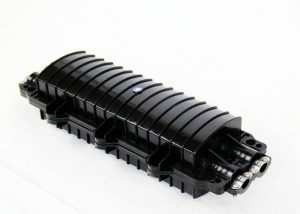 Fiber optic splice closure FOSC-H016 is made of high quality ABS material, the cover and bottom is sealing by silicon material . Hook closing design is convenient for installation and maintenance . 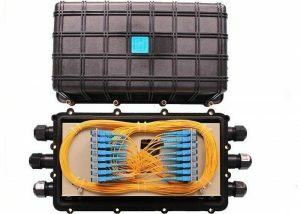 This closure box is applied to splice fiber without cutting cable , there is a rotary plate in box for patching . it also can load PLC splitters.